The Stevie Awards for Women in Business are looking for the world’s best female entrepreneurs, executives and employees. Early birds will benefit from special rates. Entry fees for most government and non-profit categories are waived. The call for entries for the 12th Stevie Awards for Women in is in full swing. Through September 23, female entrepreneurs, executives, employees, and the organizations they run, worldwide, may submit their entries to compete for the Stevie®, the highest honor in the business world. “Women are a tremendous force in the global economy,“ emphasizes Michael Gallagher, president and founder of the Stevie Awards. “We therefore want to encourage women entrepreneurs, executives and employees all over the world to seek and receive the recognition that they deserve.” Women’s power in the business world is confirmed by various national and international studies. In the United States alone, 8.6 million women own businesses. In total they employ 7.8 million people, with revenue of 1.3 trillion dollars. According to the Global Report on Women and Entrepreneurship 2012, more than 126 million female entrepreneurs were starting or running new businesses in 67 nations in that year. To recognize the workplace achievements of women around the world, the Stevie Awards for Women in Business honor women and women-run businesses in more than 85 categories including: Entrepreneur of the Year, Young Entrepreneur of the Year, Executive of the Year, Mentor or Coach of Overall Company of the Year, and Most Innovative Company of the Year, New Product of the Year, and Marketing Campaign of the Year, among others, . New categories in 2015 include Startup of the Year and Women-Run Workplace of the Year. 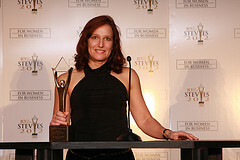 By winning a Gold, Silver or Bronze Stevie Award, business women and their organizations gain increased media awareness. Further benefits are increased brand recognition and a positive reputation as attractive employers. In a short video Michael Gallagher explains the benefits for women of entering business awards: https://youtu.be/Rm9yazD_sU8. There is still plenty of time to prepare a winning entry, but early birds will benefit from special rates, when submitting their entries through July 22. The regular entry deadline is August 26 and late entries will be accepted through September 23 with payment of a late fee. A jury of many leading women entrepreneurs, executives and luminaries worldwide will then evaluate the entries, before the winners of the 12th annual competition will be announced at a gala awards dinner at the Marriott Marquis Hotel in New York on November 13, 2015.